A step-by-step guide on how to organize recipes in a binder to make meal planning a breeze! You know how in football they have that thing called the playbook? And the playbook is full of all the different ways to get the football down the field so the team can win the game? That’s how I want you to think of your recipe binder. Your recipe binder is your playbook. And inside that recipe binder are all the ways you are going to win the “What’s for dinner?” game. Seriously though, I’ve found having a well organized recipe binder is the secret sauce that makes weekly meal planning effortless. The key to a fully functional, easy to use recipe binder is to KEEP IT SMALL. The only recipes that belong in your binder are the recipes you KNOW your family will eat and love. For that reason, I’m recommending you keep your binder in the 1 inch to 2 inch binder range. Any bigger, and the temptation will be to just start stuffing it with recipes that maybe you’ll make someday. Nope. That’s not what you want. You want to be able to grab your recipe binder and find a recipe to add to that week’s meal plan that will both get eaten and will get you the highest praise from your family. Optional Free Downloadable Cookbook Index Recipe List – This is great if you have a ton of cookbooks like I do and want to be able to find your favorites quickly. Recipes! Find these in magazines, from Pinterest, from your favorite blogger/website, or from friends and family. 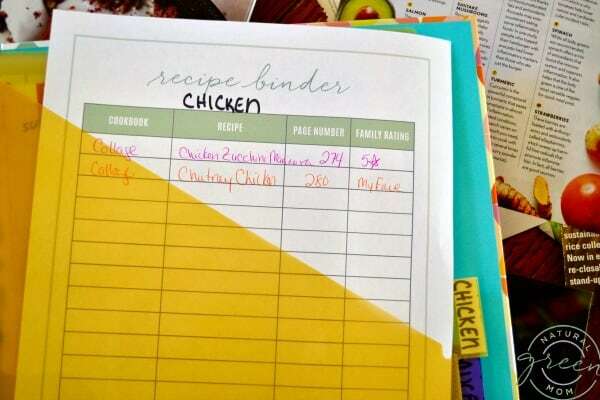 The ultimate recipe binder will help you get dinner on the table with minimal effort. For that reason, I want you to keep appetizers, sides, breads, and desserts out of your binder. If you are ambitious and want to create a second binder for those types of recipes, go for it. But for the purposes of getting dinner on the table night after night after night, make your main recipe binder one in which only main dishes are kept. Remember, your recipe binder is to be small but mighty! Few ingredients. I don’t want anything overly complicated in my binder. No exotic ingredients I won’t use again. Cuts of meat. For example, I know I don’t enjoy center cut pork chops, but I do like bone-in. My binder only has recipes for bone-in pork chops. Here’s a little unknown fact: Most families repeat the same 14 to 21 meals every month. 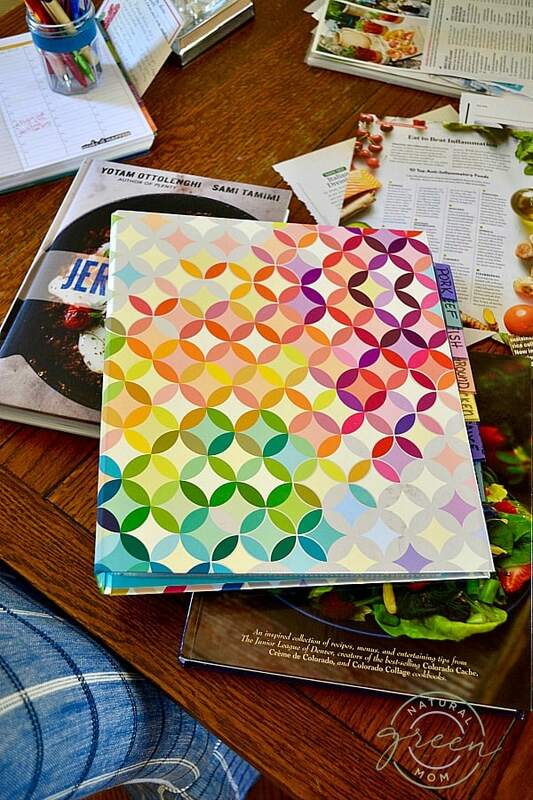 Your recipe binder is meant to keep just those tried and true recipes. My binder tabs are: Pork, Beef, Chicken, Ground (I keep any kind of ground meat in this section), Meatless, Fish, Sauces, and Pizza. As you can see, I’ve organized my tabs by proteins. If pork is on sale for the week, I want to be able to add it to my meal plan. I flip open my binder to the pork recipes and add a recipe from whatever looks good that week to my meal plan. This is the number one way I keep my grocery budget down. By focusing my meal plan on what is on sale, it allows me to save money with minimal effort. Print out a free cookbook recipe index sheet for every tab in your binder. This sheet helps you keep track of those family favorite recipes from all of your various cookbooks. Flip through your cookbooks and write down the name of the recipe, the cookbook where the recipe can be found, the page number and the family rating (optional). Instead of hunting through all your cookbooks looking for that one recipe you made that one time that your kids really liked but you just can’t remember which cookbook you found it in, write that recipe down in your binder and you won’t have to go hunt for it again! Let’s say pork chops are on sale for the week. Flip to the pork tab in your recipe binder. Look through the cookbook recipe list at the front of the tab as well as any recipes you’ve saved and added to your binder. Whatever looks appealing for that week goes on to your meal plan. 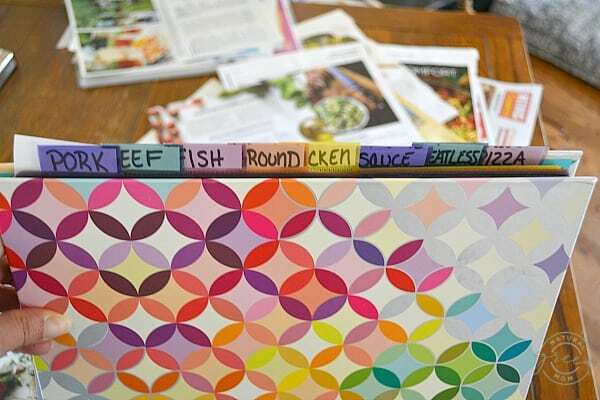 Organizing your recipes in a recipe binder can easily be done in one evening of watching TV. 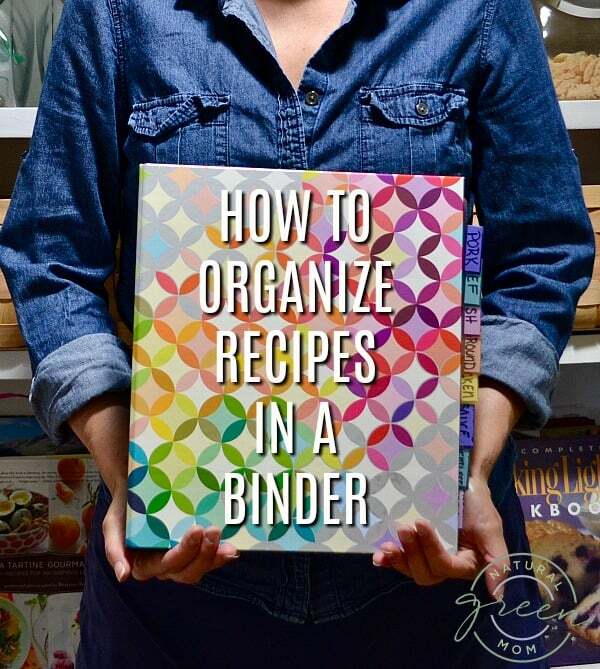 The key is to be picky about what recipes rate space in your binder. Reserve your binder for the recipes you turn to again and again and you’ll never be at a loss for what you should make for dinner. I give you a sneak peek into my binder here. How to Organize Recipes in a Binder is Part One of The Essential Meal Planning Basics Every Family Needs.